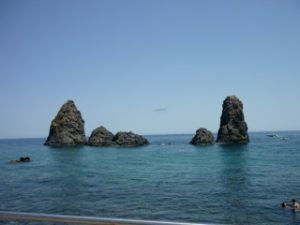 Polyphemus was localized in antiquity on the east side of Sicily, near Aetna. Pliny’s reference to Cyclopes and Laistrygonians at “the very center of the earth,” Sicily and Italy, strikingly underscores how a centrifugal journey of Odysseus in the exotic west became perceived as within the Roman world. At some point Aetna was conceived of as a natural forge for Cyclopes helping Hephaestus/Vulcan make lightning and thunder for Zeus. This would be the Hesiodic kind of Cyclopes, not the Homeric kind, who are portrayed as an exotic tribe of humans (for the various types of ancient Cyclopes, cf. R. Mondi, ‘The Homeric Cyclopes: Folktale, Tradition, and Theme,” TAPA 113 (1983) and R. Buxton, ‘Landscapes of the Cyclopes’ in G. Hawes [ed.] Myths on the Map ). By the time of Theocritus, Polyphemus myth included a story of his love for the sea nymph Galatea and murder of his rival Acis, who was transfored into the Sicilian river Acis (Ovid, Met. 13.885ff.). As Pliny at least indicates, offshore volcanic rocks north of Catania near Acitrezza were equated with the rocks hurled by Polyphemus at the escaping Greeks. Nearby is a small island, very close to the shore, called Lachea, apparently after the obscure adjective λάχεια (or is it a proper noun?) that describes the island offshore of the land of Cyclopes in Book 9 of the Odyssey (conventionally called “Goat Island”). 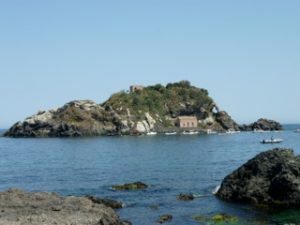 Cluver in the early 17th c. argued that the Egadi off of Trapani on the west side of Sicily provided a more appropriate “Goat Island,” a hypothesis developed at length by Samuel Butler in the late 19th c. (see further the section ‘Modern Localization’ on this site). Ovid, Metamorphoses 13.1ff., 13.770ff., 14.154ff.